There is more to the Prestige Cocktail watch than meets the eye. 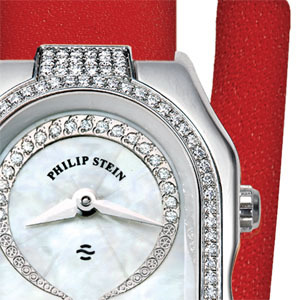 Beyond an elegant timepiece showing hours, minutes and a dual time zone, Philip Stein introduces an element of well-being to horological expertise, and equips each of its watches with a "Natural Frequency Disc" – a thin metal plate that helps balance energy flow in the body and increase resistance to stress. And what could be more beautiful than to wrap this holistic technology in a precious timepiece! 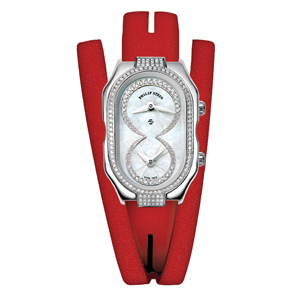 The natural white mother-of-pearl dial is enhanced with 32 diamonds around the two counters. The bezel, which is set with 112 brilliants, mirrors the curves of the polished steel case and its two crowns, a reminder of the two separate mechanisms inside. 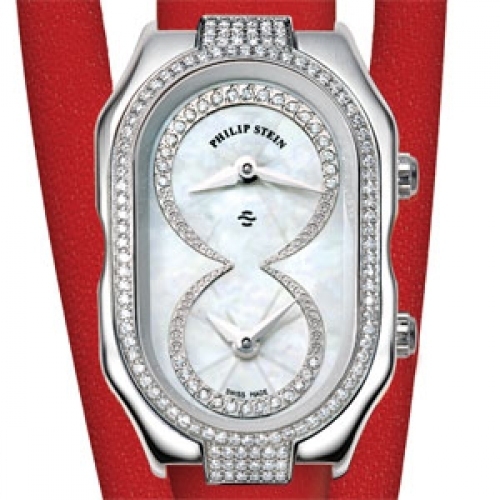 A design and values that are the hallmark of a Philip Stein watch.